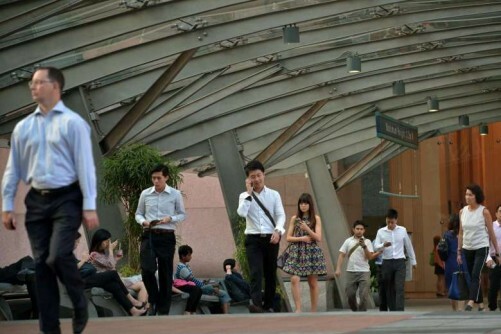 SINGAPORE - Complaints about workplace discrimination are down from last year, but the preferential treatment of foreigners has remained the top gripe of Singaporean workers for five years in a row. This made up a third of the 213 grievances lodged last year with the national anti-discrimination watchdog. The Tripartite Alliance for Fair and Progressive Employment Practices (Tafep) revealed on Friday (April 8) that complaints last year were down 18 per cent from 2014 and less than half the 475 grievances lodged in 2013. Tafep did not release an exact breakdown of the nature of complaints, but said one in six were about race, language or religion and another one in six were age-related. Manpower Minister Lim Swee Say said at Tafep's Exemplary Employer Award on Friday: "As we transform our economy to be more manpower-lean, employers must focus on building and nurturing its human capital - the workers - and adopt fair and progressive workplace practices, in order to transform and grow in the future economy." Fifteen companies - the highest number of winners to date -were presented with awards at the ceremony at the Grand Copthorne Waterfront Hotel . DBS Bank won the inaugural I-Future award, a new category that recognises organisations with progressive and future-ready practices. Mr Lim noted its POSB Active Neighbours Programme, which hires older workers as part-timers at POSB branches. The bank's managing director of HR, Ms Theresa Phua, added that it is trying to get employees to think innovatively through programmes such as app-creating hackathons. Mr Lim also highlighted 3E Accounting, a small five-year-old firm with a staff of 24 that works with start-ups and other small and medium enterprises (SMEs). It gives fathers an additional week of paternity leave and has, in the past two years, increased training hours for staff by about 13 times. HR director Stephanie Chua recalled how the firm hired a personal tax assistant manager who was five months pregnant at the interview, even though it knew she would have to go on maternity leave a few months into the job. "We want our staff to know they don't have to make a difficult choice between their personal life and their career," she said. Another winner, OCBC Bank, created support groups for its employees who are single parents, caregivers or have children with special needs. The bank invites speakers, such as divorce lawyers, to help single parents know their rights or counsellors for those whose children have dyslexia, autism or ADHD. Said OCBC Bank vice president of human resources Jacinta Low: "This is an extension of our values. It is the correct thing for us to do, and it also strengthens our employer brand."